Mike Armando is a jazz/blues/funk guitarist who plays straight from the heart with rhythmic sincerity and genuine sensitivity. Jazz/blues guitarist Mike Armando was born and grew up in Brooklyn & Woodhaven Queens, NY. He Attended Franklin K. Lane High School. In the early years Mike joined the U.S. Navy during the Viet Nam War. He served his country for 4 years and still performed when he had time. Times were tough but he still kept playing his music. He was the guitarist for the late Screamin' Jay Hawkins for three years. In February 1976 Screamin' Jay Hawkins suffered facial injuries when he was burned by one of his flaming props while performing with his guitarist Mike Armando at the Virginia Theater in Alexandria, Va. Mike shared the stage with major musical acts such as 5 Satins, Critters, Marveletts, Bobby Lewis, Velon’s, Scott Mckenzie and many more. One of Mike's recording's, Half Stepin on the mja Record label, a jazz/blues recording was rated one of the top ten records on radio play list in Bill Board Magazine. Mike has recorded with drumming great Bob Moses. He has performed on radio and tv stations across the country. WOWI Radio music director Larry Dinger, Norfolk, Va. held many events at the station were Mike performed live. Mike has performed live events at WPKN, Jazz Advantures with radio host Phil Bowler in Bridgeport, CT. Mike Armando recordings on the mja Record label have been played throughout the USA and in Europe. Mike has produced a number of jazz concerts with vocalist Nancy Monroe at the Blue Note in NYC and at the Event Center in Lake Grove LI along with jazz guitarist Dave Stryker hosted by WPKN Radio Jazz Adventure MC Phil Bowler. 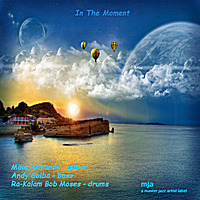 Mike Armando has produced 15 CDs on the mja label with such artists as Grammy award winner Fred Lipsius, from Blood Sweet & Tears, Nancy Monroe, David Allan Gross, Chris Clark. Pat Morrissey, Artt Frank. One of the tracks from Fred Lipsius, mja release Better Believe It CD was released and distributed throughout the world on MCA Records. mja recording artist, Artt Frank who was the drummer for the late great Chet Baker was inducted into the Oklahama Jazz Hall of Fame on November 16, 2010. Mike Armando was the producer for all three of Artt's CD's. 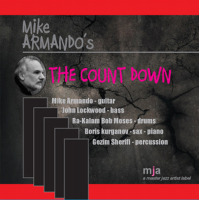 Mike has recorded with the jazz group In The Moment with bassist Andrew Golba and drummer Bob Moses and Mike's latest release The Countdown. Mike Armando has worked with Actress Sharon Stone along with drumming great Artt Frank on his CD release, Waltz for Sharon Stone. Mike was the producer for Artt's CD. 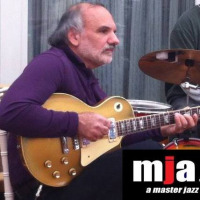 Review Jazz/Blues guitarist Mike Armando has paid his dues several times over. And you can hear it in his playing. My one time contemporary, Charlie Bird Parker once said, “You can’t play it if you haven’t lived it.” When you listen to Mike, you’ll will know from the very first note that he lived what he plays. There’s a seasoned unfiltered quality in his phrasing that awakens our ears to his affinity for the real deal form of jazz. With Mike, its all about feeling, just as it was with all of the great players of the past, and the few greats who are on the scene today. The sounds Mike has taken in and absorbed through the years didn’t come from any music school class, but straight from his life’s experiences, and from hanging around the great jazz clubs in New York City; and being able to see some of the greats perform up close and personal. Mike has a way of drawing his listeners in and making them a personal part of what he and his group are playing. Mike has surrounded himself with some really fine jazz musicians. Artt Frank - drummer for the late great Chet Baker. The term, 'In The Moment' is most generally applied to a bop/jazz musician, or group of muscians who are playing something that is totally new, spontaneous and unique so that all one can say is that it is, In The Moment, Which ironaically, is exactly what can be said about this particular group of musicians, even though the music is not all 'straight ahead', the musicians do nonetheless, play with a lot of heart and rhythm and make it all swing. The music is Blues, Funk, Rock and jazz, so the listener gets the chance to hear a lot of differen kinds of rhythm, time and beats. The musicians, Mike Armando, guitar, plays the blues as though he was born with them. I like his ideas, his lines, his chord changes and his time. I am also impressed with bassist Andy Golba's bass lines, rhythm and solid time. He doesn't waver and has a big fat sound, which as a long time drummer, is a prime requirement of mine. I've just got to have that strong tone and time behind me, otherwiise, its like trying to cook with cold grease. All About Jazz musician pages are maintained by musicians, publicists and trusted members like you. Interested? Tell us why you would like to improve the Mike Armando musician page.